Disconnect the battery negative terminal. Refer to PG-75, "Exploded View"
Remove cowl top extension. Refer to EXT-25, "Removal and Installation". Remove the RH engine mount torque rod. Refer to EM-81, "Exploded View". 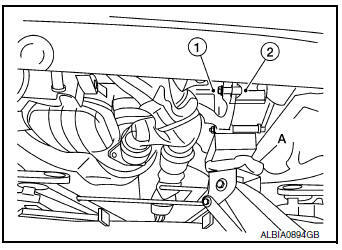 Use a suitable jack (A) to securely support the bottom of the engine (1) and the transaxle assembly (2). CAUTION: Put a piece of wood or an equivalent as the supporting surface and secure in a stable condition. Remove A/C line bracket bolt. Remove harness grounds from engine mounting bracket (RH). Remove harness retainers from engine mounting bracket (RH). Remove the engine mounting bracket (RH). Refer to EM-81, "Exploded View"
Remove the RH engine mounting support bracket. Refer to EM-81, "Exploded View". Disconnect harness connectors from intake valve timing intermediate lock control solenoid valve, intake valve timing control solenoid valve, and exhaust valve timing control solenoid valve connectors. Remove intake valve timing intermediate lock control solenoid valve, intake valve timing control solenoid valve, and exhaust valve timing control solenoid valve bolts. Remove intake valve timing intermediate lock control solenoid valve, intake valve timing control solenoid valve, exhaust valve timing control solenoid valve from valve timing control cover.
. Remove O-rings from intake valve timing intermediate lock control solenoid valve, intake valve timing control solenoid valve, and exhaust valve timing control solenoid valve. Lubricate O-rings with clean engine oil before installing. Remove the intake valve timing intermediate lock control solenoid valve, intake valve timing control solenoid valve, exhaust valve timing control solenoid valve. Refer to EM-74, "Intake Valve Timing Intermediate Lock Control Solenoid Valve, Intake Valve Timing Control Solenoid Valve, and Exhaust Valve Timing Control Solenoid Valve". Remove harness grounds and retainers from the top if the engine mount bracket. 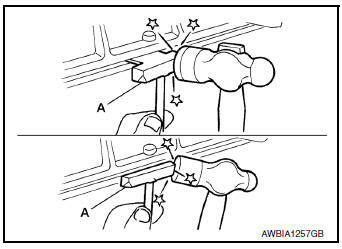 Loosen the valve timing control cover bolts in the reverse order shown. Remove the valve timing control cover bolts. 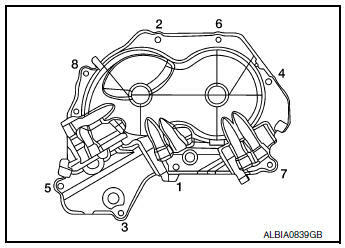 Remove the valve timing control cover by cutting the liquid gasket using Tool (A). NOTE: Do not loosen screws (A) on the back of the valve timing control cover. 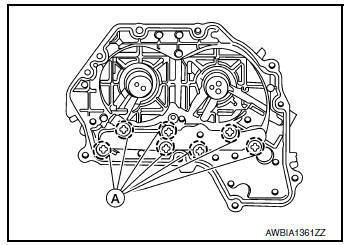 Install valve timing control cover with the following procedure. Install intake valve timing intermediate lock control solenoid valve, intake valve timing control solenoid valve and exhaust valve timing control solenoid valve to valve timing control cover. Install O-ring to front cover side. CAUTION: Do not reuse O-ring. 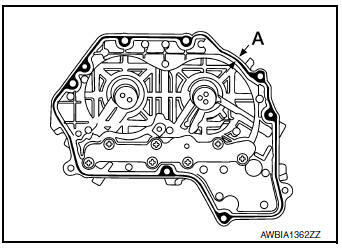 Apply liquid gasket to the positions shown. Refer to GI-22, "Recommended Chemical Products and Sealants". Install valve timing control cover. Tighten the bolts to specification in the numerical order shown.